There is not much known about Thomas Seymour’s early years. Historian and author, David Loades believed that when Thomas first came to court (sometime between 1525-1530) that he may have rented a place in London. But once his sister Jane became Queen we can assume that he always had a place at court. It would be awhile before Seymour would have a place of his own. It wasn’t until he was recognized for his military and political achievements that he finally made some progress in that arena. 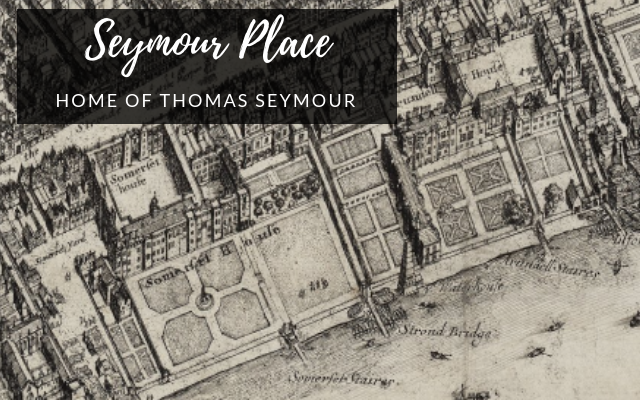 Thomas Seymour was ‘rewarded’ Hampton Palace in November 1544 and soon renamed it Seymour Place. Hampton Place had been previously owned by William Fitzwilliam, Earl of Southampton until his death in 1542. Since Hampton Place was available to Thomas Seymour in 1544, and Southampton died it 1542, we can assume that after Southampton’s death the property reverted back to the Crown. That is until it was given to Thomas Seymour on the 29th of November 1544. In less than three years from the time he was rewarded with Seymour Place, King Henry VIII was dead and Thomas Seymour, uncle to the King, was created Baron Seymour of Sudeley and as such became the owner of Sudeley Castle. The best description of location I have found of Seymour Place was that it was to the East of Somerset Place and just outside Temple Bar. In this illustration below, you will see “Temple barre” in the top right. 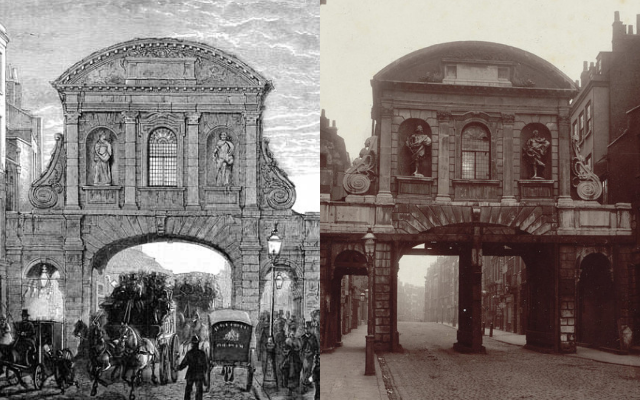 Just down and to the right of the words you will notice an arch – that is Temple Bar. 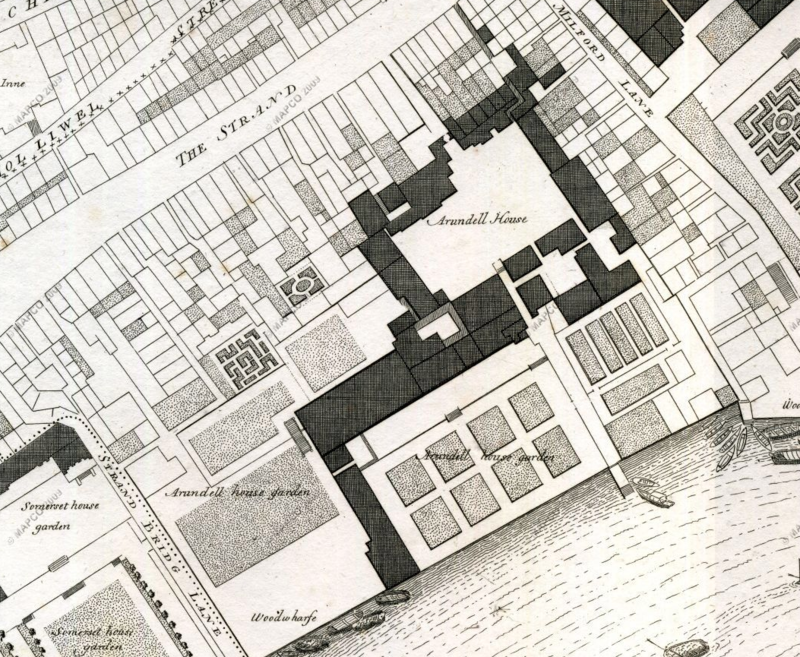 What was Temple Bar exactly? 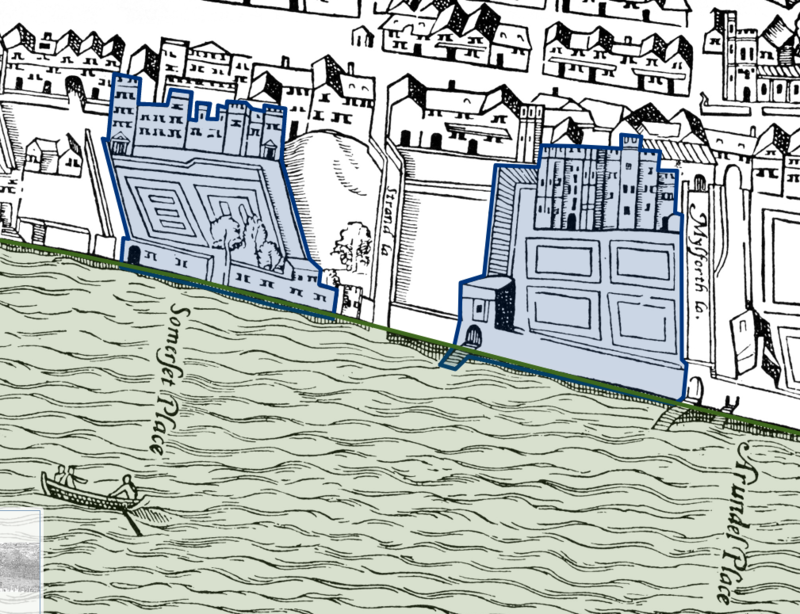 Seymour Place, which after the execution of Thomas Seymour became Arundel Place, was located on the River Thames and was between Milford Lane and Strand Lane. Strand Lane is what separated Seymour Place from Somerset Place. Arundel place was to the south of St. Clement Dane (church) and adjacent to the Roman Baths at the Strand. In the below image you will notice that Arundel Place, just to the right (or East) of it is Milford Lane. Thomas’ home was very near Temple Bar and was technically in Westminster and not London. Arundel House, from the South [from the Thames side] by Wenceslas Hollar. Courtesy of Wikimedia Commons. Seymour Place was the location at which Lady Jane Grey stayed during the time that Thomas Seymour owned her wardship. Grey also eventually moved to Sudeley Castle in 1548 with Seymour and Parr. My original impression of Seymour Place was that it was a small home. It wasn’t until I was able to get a good look at it through maps that I discovered it was quite the property and I have no doubt that Thomas Seymour made it into a grand estate.